No previous training in music or singing is required. 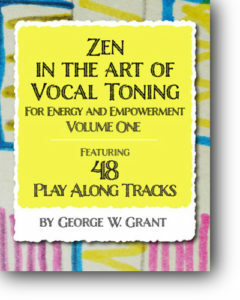 To open your heart and mind through Vocal Toning is just plain fun, and also yields dozens of health benefits. Features 48 audio tracks, including many demonstration tracks, with several chapters of philosophy, inspiration and instruction notes. In a “call and response” method, listen to short motifs and patterns on a Play Along track, then make your own Echoes or spontaneous variations in the space left for you. We start with basic ice breakers, and gradually add simple listening games. Ultimately, the Play Along tracks set you free to tone without them, in private or with friends. 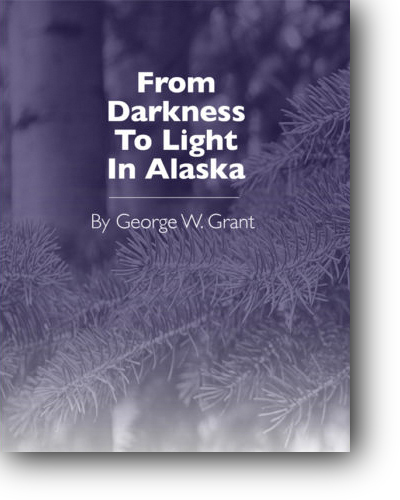 George’s literary journal of nature imagery and contemplative spirituality explores the extreme seasonal contrasts of one year in Alaska. 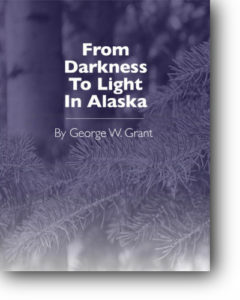 The shift from severe winter to the ecstatic midnight sun of summer naturally reflects the transformation from the dark night of the soul to illumination. There are three voices here: the objective description of the outer world, the inner personal voice of the person behind the journal, and, finally, the unification of both in a resolute voice that is at peace and beyond inner and outer distinctions. A voice of holism resides in the silence found in the moments arrested by sparse nature imagery. Utilizing his vocal toning, frame drumming, contemplative movement, sound healing, and music meditation techniques George helps students develop skills that aid them in stress reduction, wellness, self-healing, self-awareness, and team building. Secretly almost everyone loves to sing and make music. Some just don’t want to perform for an audience. You may have questions, let’s visit! I can learn about you and your goals and tailor lessons to fit your needs. Call me at (208) 720-2933 or email me here. If you email please be sure to include your name and phone number. self-healing, team building, and positive outlook. Secretly, almost everyone loves to sing and make music. Some may not want to perform for an audience. You do not have to! Without needing to sing yourself — sit in a chair or lay on your back in street clothes and learn to feel intuitive vocal toning and harmonic overtones, made specifically for you, to resonate, and integrate your body-mind-heart-soul. The voice and the drum are like a hand and a glove. Light intuitive drumming naturally supports vocal toning, without the need to learn complex traditional rhythms or meters. For those who want more, deeper rhythm training is fun with Play Along recordings. To empower both the client and the practitioner, intuitive singing has been part of hands-on healing traditions for thousands of years. Vocal Toning is extremely beneficial and supportive for many light-touch non-agenda therapies, including: Cranial Sacral Therapy, Polarity Therapy, and Reiki. If you can stand and walk, you can do Music Meditation In Motion. Anybody, at any skill level, can gently explore their own ways to move slowly, find balance, hold still, and respond to shapes of other people. Copyright 2016 VocalToning.net all rights reserved. Site design by Nelson Soucek.